Evidence suggests that children living in sole mother households fail to reach the educational and occupational levels of children reared in two parent families. It is unclear, however, to what extent the disadvantages are due to changes in family structure or to the reduction in resources available to the child. The Australian Institute of Family Studies, Parents and Children after Marriage Breakdown Study which tracked family changes and household income in the five to eight years after parents had separated, enables the relative impact of these factors on children's lives to be examined. Children in both one parent families and stepfamilies were included in the study. Among the findings are: the importance of household income before separation in terms of its effect on children's wellbeing five to eight later; current household income or even living below the poverty line did not affect children in terms of the indices of wellbeing examined, and further children in the poorest families in the study - those of sole mothers and children fared somewhat better than stepfamilies where children seemed not so happy with life at home and somewhat lower self esteem. Parental divorce disrupts the lives of nearly one in five young Australians under the age of 20, a disruption related to long-term social and economic disadvantages. Evidence suggests that children living in sole-mother households fail to reach the educational and occupational levels of children reared in two-parent families (OECD 1991). It is unclear, however, to what extent the disadvantages are due to changes in family structure or to the reduction in resources available to the child. The effects of both these changes are likely to be complex and to become apparent only in the years following parental separation. The Institute's Parents and Children After Marriage Breakdown study which tracked family changes and household income in the five to eight years after parents had separated, enables the relative impact of these factors on children's lives to be examined. Since the children are now teenagers with an average age of 14 years, the sorts of observable effects are those associated with that period of their development. Indices of psychological wellbeing in adolescence may, however, be precursors of the children's attainment in adult life. In Australia, the experience of children after parental divorce has much in common with that in other countries. For example, it is usual in countries as far apart as Australia and Sweden for children to live with their mother after their parents separate (Khoo 1989; Agell 1991). In addition, the household in which the children live after their parents separate is likely to suffer a considerable financial loss, despite public assistance and support from the father. In Australia, when adjusted for the number of people in the household, the disparity between the pre-separation income and that of the sole-mother, and between the child's household and the non-resident father's household, is even greater. Children experience material loss relative to their conditions before the parental separation, and relative to the conditions in the household of the non-resident father. The risk of poverty in lone-mother households is well documented, as is the prevalence of this family type (Burns and Cairns 1987). This reduction in income and, in the extreme, poverty, may affect children's wellbeing directly or indirectly, in the short or long term. Among many factors, a lack of resources for educational and social development, dependence on welfare, or the lack of models of achievement and success may lead to decreased adult competence. National cohort studies also provide convincing evidence that divorce, through changing their socio-economic status, disadvantages children with respect to their educational and occupational achievement (Wadsworth and Maclean 1986). However, distinguishing the effects of parental separation per se from that of post-separation family changes, or the effects of changes in resources from those associated with living in a particular family type is not easily achieved. Parental separation, a marker more important in children's lives than legal divorce, is an event within a process that involves the breakdown of the marriage and subsequent adjustments such as the move from a sole-parent household to one where there is a step-parent. In Australia almost half the children whose parents divorce have a stepfather living in the household within the next six years (Khoo 1989). About a third of these also have a half or stepsibling living with them (see Ruth Weston's article in this issue). These family changes have important implications for the household economy. Although the addition of a male earner increases the household income, new children may reduce the amount of time that a mother is able to work and reduce the resources available for each household member. However, on the other hand, the addition of another caretaker can allow the mother to return to full-time work, increasing household income through a second channel (Funder 1989). When household income is adjusted for needs, it is apparent that sole-mother families have incomes lower than the average national household income for families with dependent children, lower than the pre- separation family, and lower than the household of the non- resident father. 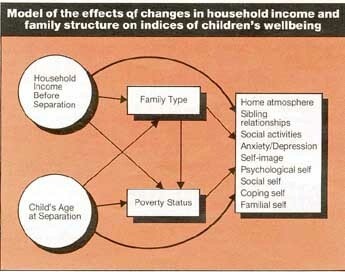 The addition of a stepfather's income, however, brings household incomes back into line with the family income as it was before parental separation (Weston 1989). Whether or not children are content with where they live and with their relationships with other family members after their parents separate has a significant bearing on their quality of life. Despite the fact that stepfathers are likely to increase the material resources available to children, they are also associated with greater conflict in the household and children leaving home earlier (Young 1987). In addition, the self-esteem of young children in stepfamilies appears to be lower than in sole-parent families (Ochiltree 1990). In contrast, mothers appear to benefit from the presence of a stepfather, with repartnered mothers reporting greater satisfaction with life and greater general wellbeing than those who remained single (Weston and Funder 1990). Mothers perceive their new partners as a support in parenting, and willing providers of material resources (Funder 1991). These contrary effects of a step-parent make understanding the effects of changes in material resources all the more difficult, especially as family changes that add to the material resources of the child appear to have detrimental effects on children's attainments in adulthood (Wadsworth and Maclean 1986; McLanahan and Bumpass 1988). Divorce sets in train events that are themselves responsible for later events in the lives of family members. For example, reduced material resources following parental separation could affect the chances of a child reaching his or her full potential. Through the lack of resources, children may be deprived of educational and social opportunities, thus limiting their horizons. These limits may restrict vocational plans, particularly with respect to tertiary education. A lack of resources may also diminish the opportunities for children to develop their self-esteem and competence by reducing opportunities to participate in social and educational activities. Children may also be encouraged to leave an uncongenial home with relatively few resources or relatively high levels of conflict. Leaving home early has been linked with early sexual experiences and early childbearing, which in turn are associated with lower attainment in adult life. Although complete chains of events can rarely be explored, some aspects along the way may be examined to improve our understanding of family changeeconomic shift and their combined and individual effects in children's lives. How children adjust in the short and medium term to their parents' separation is linked to several aspects of their psychological wellbeing. Children who are unhappy at home are perhaps more likely to leave or be encouraged to leave. Thus general contentment with the atmosphere at home and the time spent there may be indicators of how suitable that environment is for the child. Engagement with ordinary social activities and access to clubs, friends and cultural pursuits may similarly be an index of full development at a later stage. Self-esteem has been associated with family dynamics and family type in the period after separation (Ochiltree 1990), and may be associated with more positive approaches to educational and occupational endeavour. The emotional state of the child, whether depressed or cheerful, anxious or calm, may also be associated with their wellbeing and future achievement. Collectively, indices such as these may provide a glimpse of how well children will adapt to life after their parents divorce. When related to economic circumstances and family changes, these indices may reveal something of the ways in which changes affect later attainments via indices of wellbeing in adolescence. From the Institute's study, Parents and Children after Marriage Breakdown, the household income and family change of 55 former couples with 105 children were tracked in the five to eight years after parental separation. Parents divorced between 1981 and 1983 (about two years after separation) were interviewed in 1984 and 1987. They provided detailed information about the economic conditions in the home before they separated and in the following years. Changes in the membership of households after separation were also recorded. Household income from all sources including child support was adjusted for the needs of people dependent on it and expressed for both interviews in 1987 dollars (Weston 1989). On this basis, households were also categorised as poor or not poor according to national standards. To explore the effects of family composition, children's families were divided into sole-parent and step-parent families. Psychological wellbeing measures were recorded from interviews with the children. Children rated the atmosphere at home and the atmosphere at the non-resident parent's home, how well they got along with their siblings, and how socially involved they were. They completed the Offer Self- Image Inventory (1982), which considers self-image as a global measure and in terms of different aspects of self psychological, social, coping and familial. Finally, they indicated how anxious or depressed they had felt in the last month. From these data it was possible to explore the effect on children's psychological wellbeing of changes over time. The way this was done is presented in the accompanying Figure which represents schematically this investigation. Three main questions were asked. What are the effects on child outcomes of material resources available to the child in the home before separation, independently of family changes and current family resources? How do family changes and different family types over the period after separation affect children, independently of material resources of the family before separation and currently? How does poverty in the current family affect outcomes for children? The first issue addressed was that of the effects of changes in income on children's wellbeing; the second was family type. The level of income in a household before parents separate appears to have significant and long-lasting effects on some aspects of children's lives. Higher household income appears to be associated with higher self-esteem in children and a better relationship between siblings. Household income is indicative of the milieu in which the child was raised in his/her younger years. Since children in this study were an average of six-and-a-half years old at the time of separation, both their early experience and their parents' priorities, hopes and expectations for them may carry over after separation, providing some continuity in the lives of the children despite economic hardship and family change. Surprisingly, the income in the child's household at the time of the study did not appear to have any significant effects on the outcomes for children after taking account of the impact of pre-separation income. Moreover, when both pre-separation and current incomes were measured together, it appeared that the difference in income between the household before and after separation did not have a significant effect on the aspects of children's lives considered here and the earlier economic circumstances continue to operate in children's lives after parental separation. To look more closely at the impact of current household income on psychological wellbeing, the effect of living in poverty at the time of the study was examined. Poverty, as defined by having an income less than the Henderson poverty line, had no significant effects on the indices children's psychological wellbeing. Perhaps counter intuitively (since children with more material resources might be expected to do better), children in poor households appear to do slightly better than others: they were happier in their home, got on better with their siblings, and had a somewhat better self-image. When children in stepfamilies were compared with those living with their mothers alone, no significant differences in wellbeing were observed. However, there was a slight but consistent tendency for there to be some advantages in remaining in a sole-parent family: children found their homes more congenial, their siblings more compatible, and had a better self image. The converse was true for children in stepfamilies. The Institute's Parents and Children After Marriage Breakdown study is a rare data set for two reasons important to the questions posed here. First, it tracks families through the major transition of divorce using relatively refined measures of the household income at each interview. Second, both parents and children in each family participated in the study and the children's psychological wellbeing measures are independent of the parental information. On the other hand, caution is required in interpreting these results. The sample, although the best attempt in Australia to get a representative sample, is biased by having more educated and higher income members. Thus the failure to report effects of poverty may be because the very poor, or multiple-disadvantaged, were under-represented. The numbers are also rather small for making reliable estimates of effects and no estimates are reported here. Finally, small numbers and limitations in measures may mean that significant effects are not apparent. These cautionary points guide the following discussion. An unexpected finding is the continuing power of household income before separation to affect children's wellbeing five to eight years later. Clearly income is a proxy for a whole milieu in which the child lived until the marriage ended, when the children were on average about six years old. Income may also be an index of the parents' continuing hopes and aspirations for their children together with the ways they supervise and care for them. But whatever income means, it draws attention to the importance of early experience and to the continuities in children's lives which are sometimes overlooked in studies on the effects of divorce. Moreover, as large American and British studies suggest (Kiernan 1990; Elliott and Richards 1991), attention should focus on the pre-separation effects on children's development along with effects of the divorce and its sequels. This can only be done in longitudinal studies of which the Institute's study, Parents and Children After Divorce, is an example. Second, independently of the type of family the child lived in and financial resources in the household before separation, current household income, or even living below the poverty line, did not significantly affect children in terms of the indices of wellbeing examined. This may reflect that this sample was not representative of the really poor, and that the measures used are imperfect. However, if these results hold up in other studies, it may mean not that poverty is unimportant for children, but that mothers adjust their earnings to make sure that children have enough of their time, care and attention to have a happy home and to have a positive sense of self. The poorest households were those in which mothers were not in paid employment for reasons overwhelmingly child-related. From their comments, these mothers were mostly concerned about their capacity to provide adequate care and attention for their children. They were apparently making good judgments about this since children in sole-mother families fare somewhat better than those in stepfamilies, whether or not the influence of household income was controlled. Children in stepfamilies lived in households with considerably higher average incomes than those in sole- mother families, but it seemed that these children were not so happy with life at home, and had somewhat lower self- esteem. It appears that sole mothers are doing a relatively good job of rearing their children, even though those children carry a much higher risk of poverty than other children. Mothers in all family circumstances stressed their involvement with children and children's wellbeing as major concerns in their lives. The failure to find significant psychological deficits in children in sole-mother families should shore up resolves to make these families economically viable by enabling mothers to combine successful child rearing with adequate earnings and income support. To sum up, this study suggests that future work on the effect of divorce on children's wellbeing should beware of the possible confounding of pre-existing conditions in the marriage with the effects of the breakdown and subsequent changes. Furthermore, the pejorative connotations of sole- mother families receive no support here. Children in these families appear to suffer no discernible disadvantage compared with children who reside once again in two-parent families. They are poorer, however, and perhaps the efforts of their mothers to maintain them on a par with other children will not carry through into later vocational opportunities. Investment in assuring these children a future seems well warranted. This article is condensed from a paper presented in a symposium 'Adolescents and Divorce: International Perspectives from Longitudinal Research', convened by Eleanor E. Macoby (Stanford) and Kate Funder (AIFS), at the International Society for Behavioural Development, Minneapolis, 37 July 1991. Agell, Anders (May 1991), Personal communication. Burns, A. and Cairns, S. (1987), 'Mother-headed families: a cross-national comparison', Australian Journal of Family Law, Vol.1, May, pp214233. Elliott, J. and Richards, M. (1991), 'Children and divorce: evidence from the British National Child Development Study', Paper presented at the International Society for the Study of Behavioural Development, Minneapolis, 37 July. Funder, K. (1989), 'Women's post-separation work histories', Child Support Scheme Evaluation Report No.3, Australian Institute of Family Studies, Melbourne. Funder, K. (1991), 'New partners as co-parents', Family Matters, No.28, April. Khoo, S.E. (1989), 'Family reformation', Paper presented at the Third Australian Family Research Conference, Ballarat, November. Kiernan, K.E. (1990), 'The impact of family disruption in childhood on transitions made in young adulthood', Paper of The Family Policy Studies Centre, London NW1 6XE England. McLanahan, S. and Bumpass, L. (1988), 'Intergenerational consequences of family disruption', American Journal of Sociology, Vol.94, No.1, pp130152. Ochiltree, G. (1990), Children in Stepfamilies, Prentice Hall, N.Y.
OECD (1990), Lone Parent Families: the Economic Challenge of Changing Family Structures, Organisation of Economic Co- operation and Development, Paris. Offer, D., Ostrov, E. and Howard, K.I. (1982), The Offer Self-Image for Adolescents: A manual, Special publication (Chicago: Michael Reese Hospital & Medical Center). Wadsworth, M.E. and Maclean, M. (1986), 'Parents' divorce and children's life chances', Children and Youth Services Review, Vol.8, No.2, pp145159. Weston, R.E. (1989), 'Income circumstances of men and women after marriage breakdown: A longitudinal study', Paper presented at the Australian Institute of Family Studies Third Australian Family Research Conference, Ballarat College of Advanced Education, 2629 November. Weston, R.E. and Funder, K. (1990), 'There is more to life than economics', Australian Institute of Family Studies, Melbourne. Young, C. (1987), Young People Leaving Home in Australia: the Trend Towards Independence, Australian National University, Department of Demography, Canberra. Mothers with young children: Should they work? Do they want to work?